Little Eden is a Christian camp located on Portage Lake in beautiful Northern Michigan. The camp is a religious non-profit organization, operated by a board of directors who are appointed by the 900 plus members of Little Eden. These members love the camp and are committed to, in agreement with and supportive of Little Eden's programs. In October of 1944, five Mennonite men from Northwest Ohio learned of some camp property for sale on Portage Lake in Onekama, Michigan. The men came to look at the property and told the owner they would like to buy it over a period of time, as they did not have money available for the purchase. The offer was refused, so they headed back to Archbold, Ohio. However, they soon stopped and decided to pray about it. After doing this, they felt led by God to return to Onekama and purchase the property. These visionary men saw a need to provide a place for children, youth and families to gather -- away from their daily routines -- to relax, recreate and re-energize themselves in a Mennonite Christian atmosphere. The sale of stock financed the purchase of the property. In the late 1970's, the stockholders met and decided to deem the stock worthless. Thus, the original stockholders "donated" the purchase of the camp. The summer program has basically remained the same for the past 70 years. There continues to be youth camps, family camps, and golf and quilt weeks. During the summer months, Little Eden provides a resource person who gives the Sunday message and leads the morning and evening chapel sessions. In addition, a beautiful beach on Portage Lake and a variety of recreational activities are available. There are also wooded hiking trails and an active craft shop. Activities for many take place off camp -- at Lake Michigan, relaxing walks into Onekama, or shopping, eating and sight seeing in the quaint nearby towns. 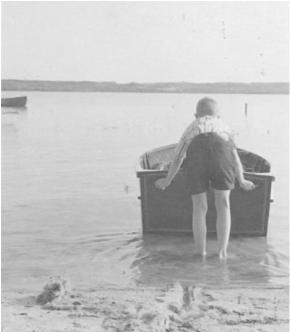 Many summer families have been coming to Little Eden since the 1940's and have established lasting relationships during their particular summer week. The draw for them is the beauty of this area, the fellowship, the Christian atmosphere and community which they have created over the years. Little Eden continues to reflect its Mennonite heritage, but with the passing of years and generations, serves the broader Christian community. Perhaps the biggest change at Little Eden was when it became a year-round retreat center in 1992. 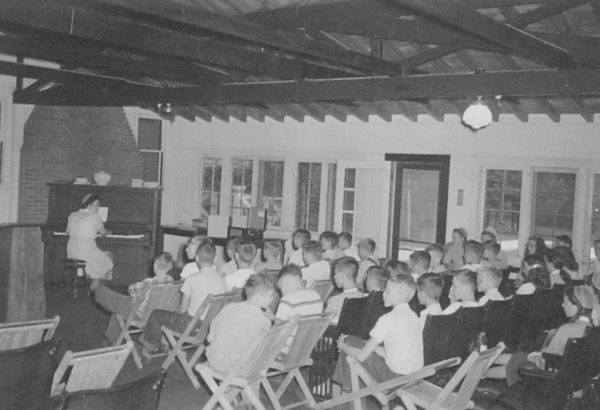 At that time, Little Eden began to host various church and family groups from September through June from Michigan and the Midwest..Family reunions, women's retreats, men's retreats, churches, youth groups, and individuals use the camp for worship, relaxation, fellowship, or retreat purposes. With immaculate facilities designed with families and adults in mind, most groups who use Little Eden return year after year. In 2014, Little Eden purchased a piece of property which was surrounded by the camp and is now in the process of formulating a plan to best utilize that property for our family camps, youth camps and year round retreat groups. Since 2014, a task force has looked at the needs of the camp, including the more than 500 families on the waiting list, to develop a proposed Master Site Plan. In September of 2016, the Board approved an initial proposal (shared in the November 2016 Echoes) to submit to the Onekama Planning Commission to open dialogue with them regarding what they might be willing to consider as an amendment to our special use permit. This plan is still only a proposal and will continue to evolve as we interact with the Township and receive feedback from campers. Below is a video, shown the summer of 2017, highlighting the work of the task force and board as it relates to developing the new property.